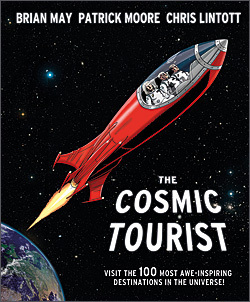 We have just published the latest Press Release about The Cosmic Tourist. You can read it on The Cosmic Tourist page. Welcome to the BANG UNIVERSE Website! Take your seats for the greatest tour ever – one that encompasses no less than the whole of the Universe. En route, we stop off to gaze at 100 amazing sights – from asteroids to zodiacal dust and from orbit around the Earth to beyond the most distant galaxies. We start right here on Earth, with your tour guides: the three intrepid cosmic voyagers Patrick Moore, Brian May and Chris Lintott. They explain the sights, what they are, and how they fit into the astronomical zoo of familiar and curious objects and phenomena. The trio express their own personal enthusiasm for each marvel you encounter. The images present the extraordinary beauty of the Universe as seen through the eyes of the biggest and best telescopes on Earth and in space, and occasionally in the backyards of expert amateur observers. Our book, modestly entitled “BANG! – The Complete History of the Universe” is now available, and this site is intended to build a companion community for those interested in matters relating to the book. We all, Patrick Moore, Chris Lintott and myself, plus the whole BANG! team, hope that the interactive nature of BangUniverse.com will stimulate constructive discussion of the astronomical topics raised in the book. In addition we will be open to suggestions to do with improvements that might be made to the site as time goes on. We will welcome constructive questions, suggestions and criticisms, and one of our first projects, as the site grows, will be to construct a Questions & Answers feature to enable quick answers to be found for the queries most often raised. For me personally, the writing and researching of BANG! have been a wonderful voyage of discovery; I feel hugely privileged to have been able to spend time with Sir Patrick and Chris over the last two and a half years, and take part in the creation of something which we all hope will inform, and excite, and entertain, and provide a new generation of potential astronomers with inspiration. We stress: BANG! is written in ENGLISH, rather than the language of mathematics, designed to be clear to anyone not previously deeply immersed in Astronomy, but with an appetite for understanding; if there are sections in BANG! which are hard to follow, we would like to know about it, so we can make improvements, when the book is (hopefully!) prepared for its first reprint.